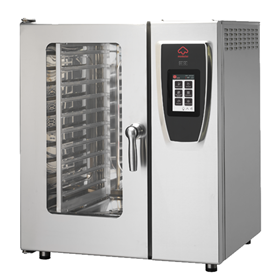 Find and buy combi ovens for sale from verified manufacturers and suppliers on HospitalityHub, Australia's hospitality equipment marketplace. Contact vendors for a free quote or expert advice on combi ovens. Delivery available Australia wide. We supply a range of combi ovens. Combi ovens are one of the most powerful & versatile tools found in professional kitchens. Being more expensive than average ovens, it‘s important to make an informed decision when buying. This guide will get you up to speed with what you need to know when purchasing a combi oven for your business. Combination ovens, commonly referred to as combi ovens give the option to cook using one of three different modes: convection, steam or a combination of both. These multi-function machines can increase productivity in your kitchen while saving you valuable space.